I do photos not only in Thailand, but in all Asia region also. At this blog post i will show my impressions, feelings and thoughts about Laos. As its usual for me, this photos are reflection of those spiritual, historical and cultural layers, which I see and feel. So, the main aim for me during creation of such photos – try to reflect those things, that show THROUGH materiality of our world. With every photos i’m giving my comments, that will help to understand the photo. Wat Inpeng, Vientiane, Laos. Wat Inpeng (“Temple of Transform”) belongs to the Mon and Khmer cultures. 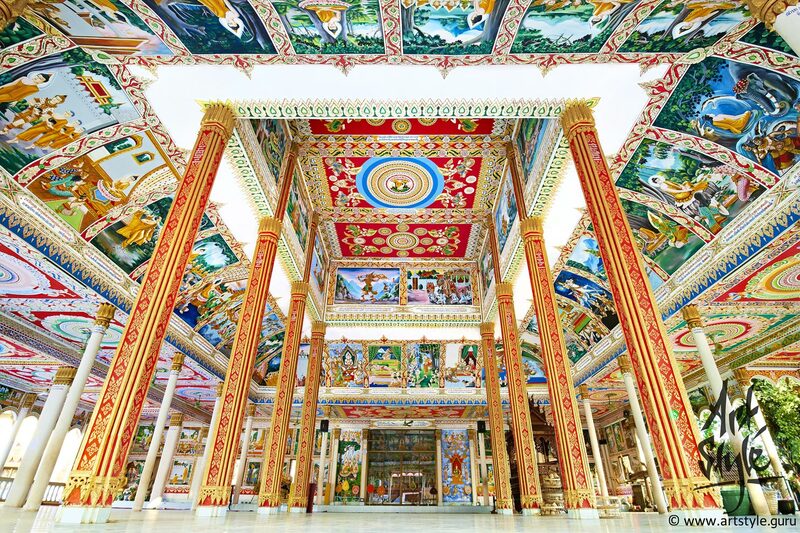 This temple is noted by its beautiful frescos in traditional Laotian colours. Fresco technique is not common for Buddhism art and at Laos it was developed under the influence of European (French) art, where frescos always played important role in religious decorating. Indra shrine, Wat Inpeng (“Temple of Transform”), Vientiane, Laos. 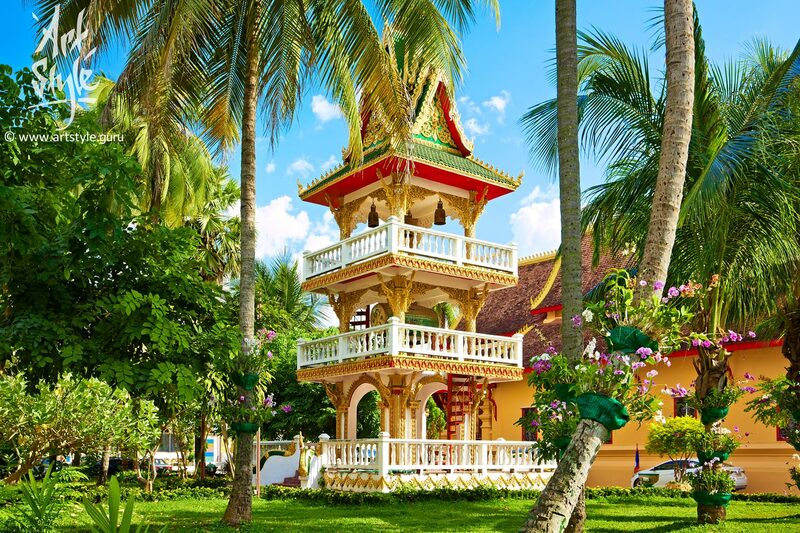 According to legends, God assisted in the construction of this Pagoda by assuming the forms of an old wise man and an old white monk. Laotian people have caught correct the entity who assisted in the construction – it was done under the Indra influence. That is why there is the Indra shrine at the territory of the temple (normally there are only Buddha shrines at the territory of Buddhist temple). Ho kong of Wat Ong Teu Mahawihan (drum tower of Temple of the Heavy Buddha), Vientiane, Laos. 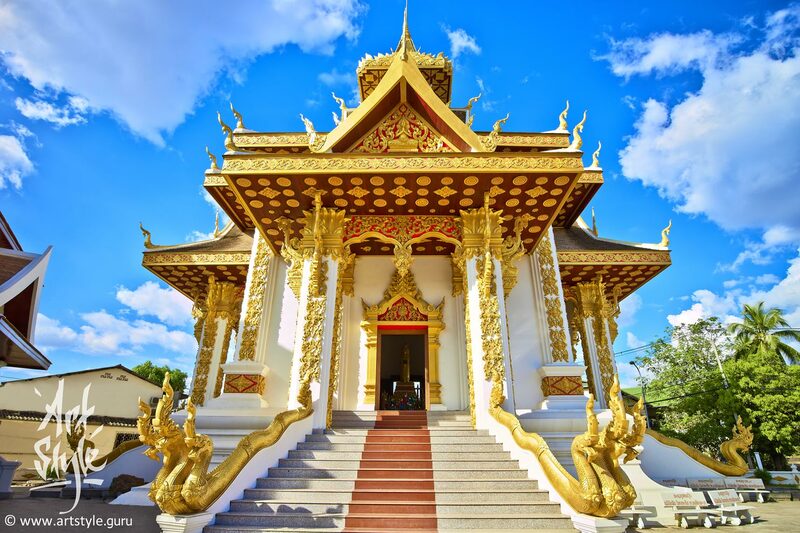 This temple was initially constructed by King Settathirat I in the 16th century (known as the golden age of Buddhism in Laos). The original use of this wat was for ceremonies of allegiance to the king. Bell and drum are important implements in a Buddhist temple, functioning as a signal for monks to gathertogether correspondingly to the Buddha Dharma (teachings of the Buddha of the cosmic law and order). Since the bell creates a unique peaceful sound of Buddha and the drum can awaken those who have lost themselves in the chase of fame and fortune, “the morning bell and evening drum” have become one of the important Buddhist symbols for people to know about Buddhism. Monks having their lesson at Sangha school, Wat Ong Teu Mahawihan (Temple of the Heavy Buddha), Vientiane, Laos. Sangha – monastic community of ordained Buddhist monks (bhikkhu). Schools are rather organic part of Sangha, because literally the Sangha of the Blessed One’s disciples is: 1. practicing the good way; 2. practicing the upright way; 3. practicing the knowledgeable or logical way; 4. practicing the proper way. 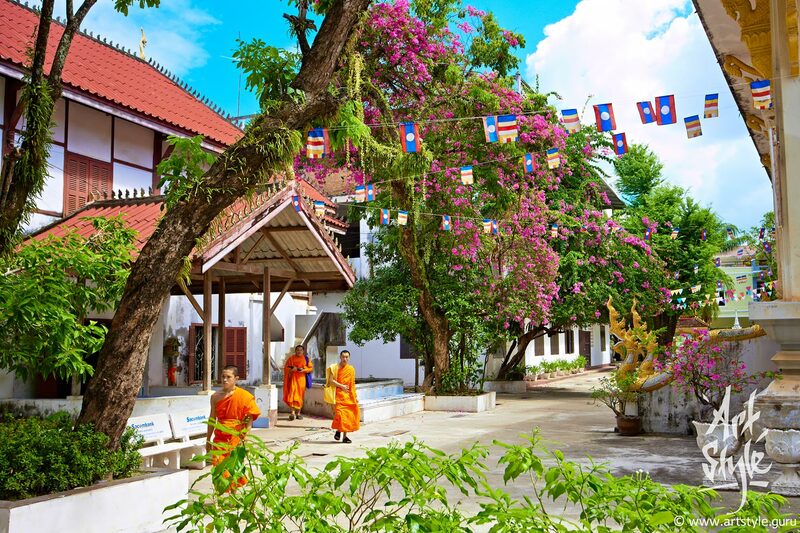 In the 17th century Souligna Vongsa as king transformed Wat Ong Teu into a Buddhist learning center in order to ‘teach, enlighten and inspire worshippers.’ In other words, it has become a school for monks coming from around Southeast Asia to study the dhamma. 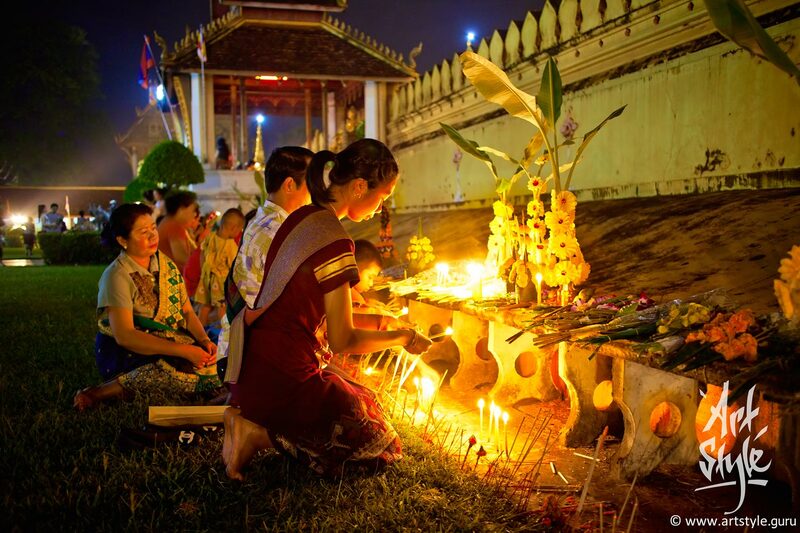 This becomes apparent because surrounding countries of Laos sent their monks to Vientiane to study this religion. 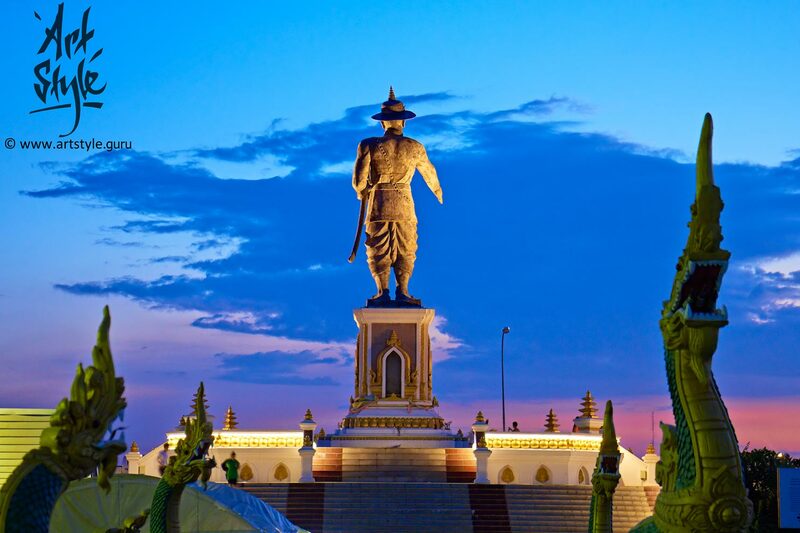 This picture represents may be the most dramatic moment in the Laotian metahistory: Chao Anouvong, the last monarch of the LaoKingdom of Vientiane, led the Laotian Rebellion (1826 – 1829) and was defeated by Siam. In spiritual layers it caused the fact, that guiding spirit of the Laotian metaculture has been defeated by Siam witzraor and eliminated from influence on his people and can’t do it anymore. (Witzraor is the huge squid-like daemon living from inside the Earth’s shell in the parallel spiritual world which represents the state or the empire). Inner yard of Wat Haisok, Vientiane, Laos. National Laos flags with flags of the Buddhism represent social and religious unity of the country. Symbolic meaning of the colours of the Buddhist flag practically matches with the same meanings in Christianity. Wedding at Wat Haisok, Vientiane, Laos. Laotian believe, that true love happens only with those couple, who have been in love at their previous life, that’s why as usual they get married only once at they life. According to Buddhist traditions, all kind of unions are blessed, if people in that union help themselves and each other to be better, to develop human creative potential and to enlighten the world. It is interesting, that according to Laotian traditions, bride can take not only surname of her groom, but his name (!) also. City Pillar Shrine, Vientiane, Laos. As many other Asian people, Laotians clear understand and feel existence of powerful creatures, which can be called “demons of the big cities”. Every big city has only one of such creatures, every of them have their own individuality, which can be perceived by feeling “character and feeling of the city”. Such demons mostly influence onto citizens sexual sphere, trying to turn human creative impulse into sexual and orgiastic activities. Demons reach their maximum influence at the time of new moon and their minimum – at the time of full moon. That’s why all the most important Buddhist rituals are happened at the night of full moon and at the day before it. City Pillar Shrines are human attempt to negotiate with demons of the big cities and influence onto them. Wat Simeuang, Vientiane, Laos. 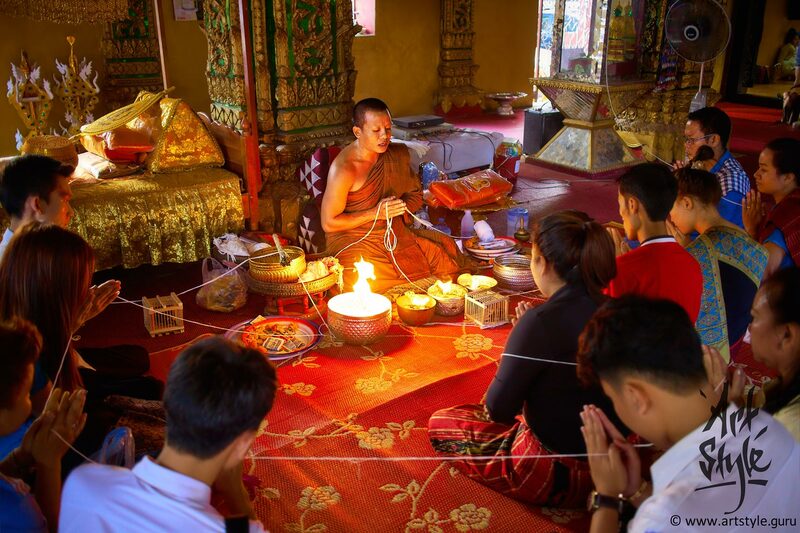 Though Buddhism in Thailand and Laos have common roots, Buddhist practices here are quite different. During their rituals (blessing, purification, etc.) 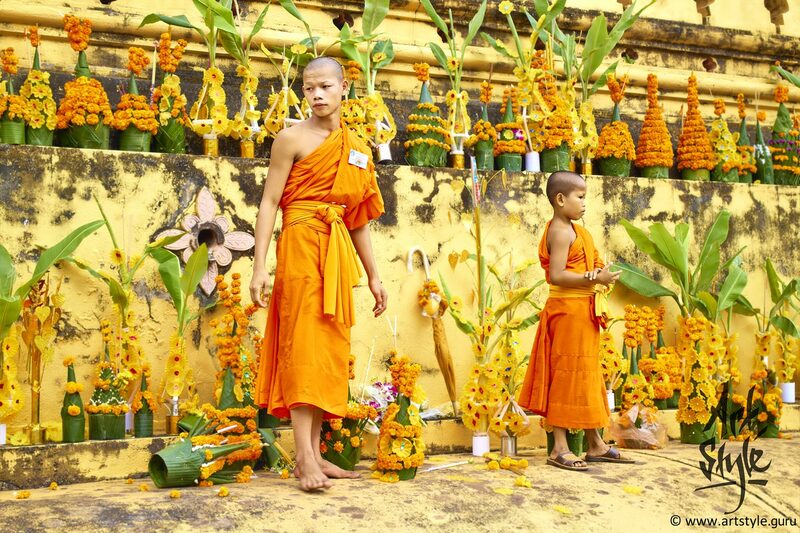 thai monks prefer to use water, whereas lao monks prefer to use fire. I feel fire practices more ancient, but water practices more powerful. 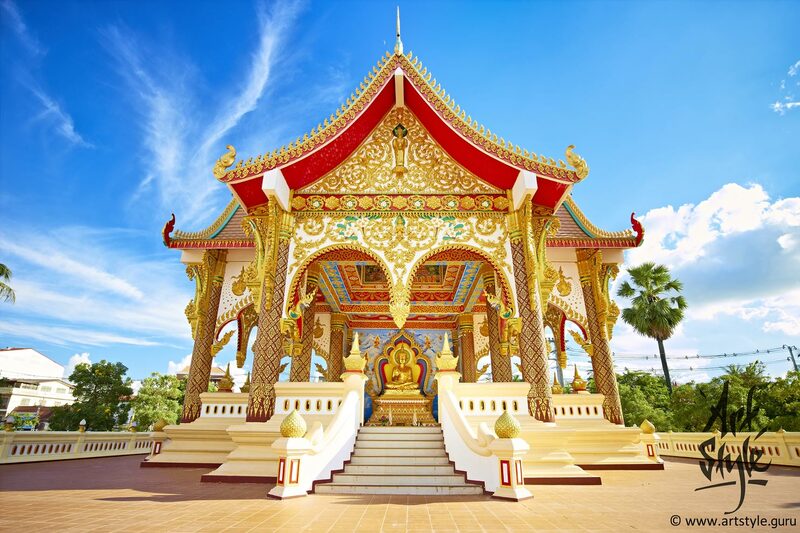 Pavilion for rest, Wat That Luang Tai, Vientiane, Laos. 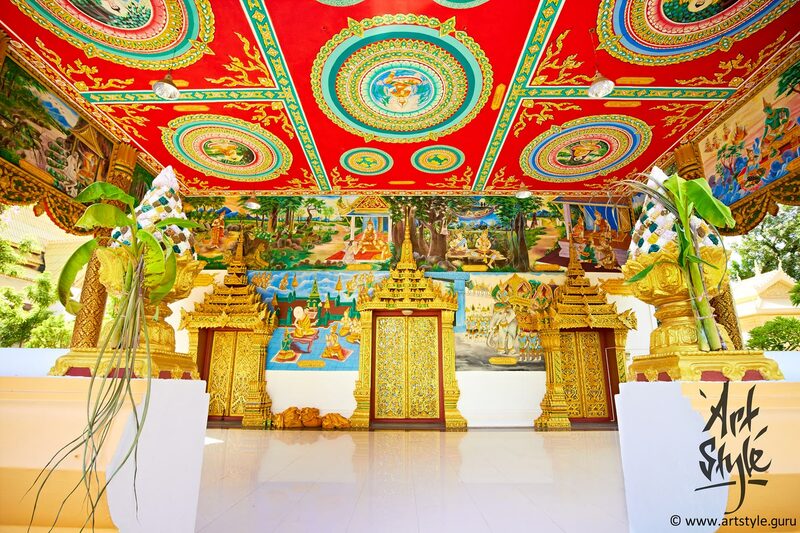 There are frescos at the ceiling illustrated the most important and decisive moments from the life of Siddhārtha Gautama, who more known after his enlightening as Buddha. To see frescos the photo is specially uploaded in high resolution. Chapel of the Wat That Foon, Vientiane, Laos. 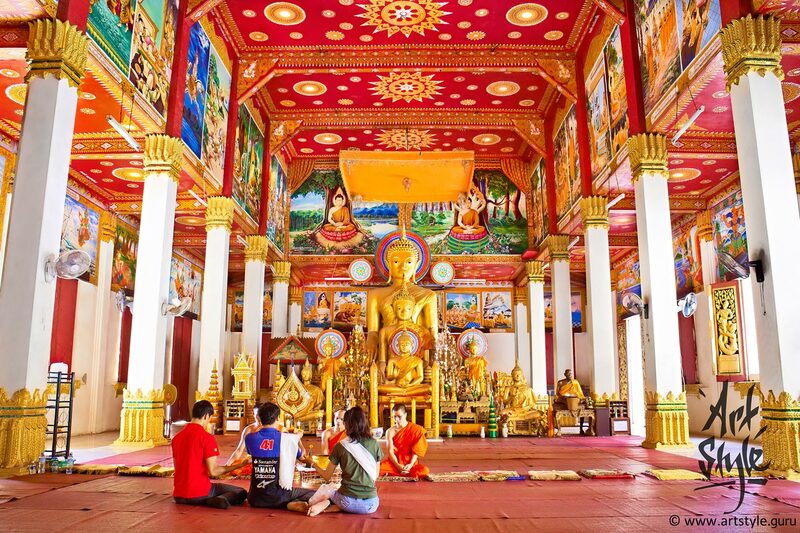 Though Laos and Thailand share the same branch of Buddhism – Theravada (Hinayana), cultural and religious traditions of both countries are quite different. For example Buddha’s aura in lao tradition rather frequently is painted with blue, yellow and red colours. 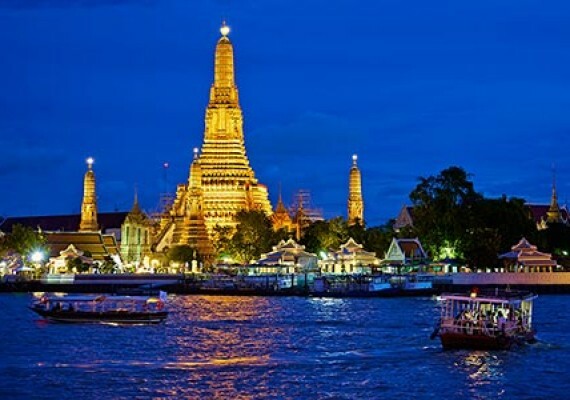 At thai tradition most used colour for Buddha’s aura is yellow or orange, sometimes – white. Blue (Nīla): Loving kindness, peace and universal compassion. Yellow (Pīta): The Middle Path – avoiding extremes, emptiness. Red (Lohita): The blessings of practice – achievement, wisdom, virtue, fortune and dignity. White (Odāta): The purity of Dharma – leading to liberation, outside of time or space. Orange (Manjesta): The Buddha’s teachings – wisdom. Pha That Luang, Vientiane, Laos. 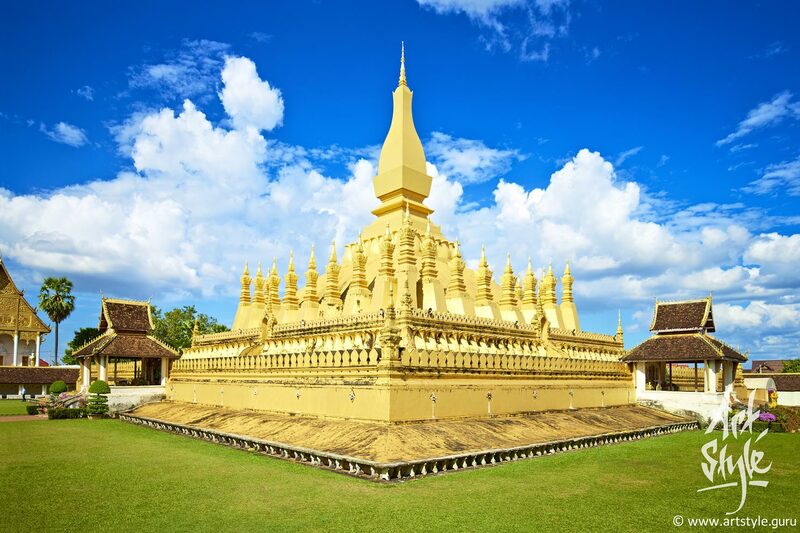 Pha That Luang – ‘Great Stupa’ is a gold-covered large buddhist stupa. Its initial establishment, suggested to be in the 3rd century. It is generally regarded as the most important national monument in Laos and a national symbol. It reflects united soul of lao people. 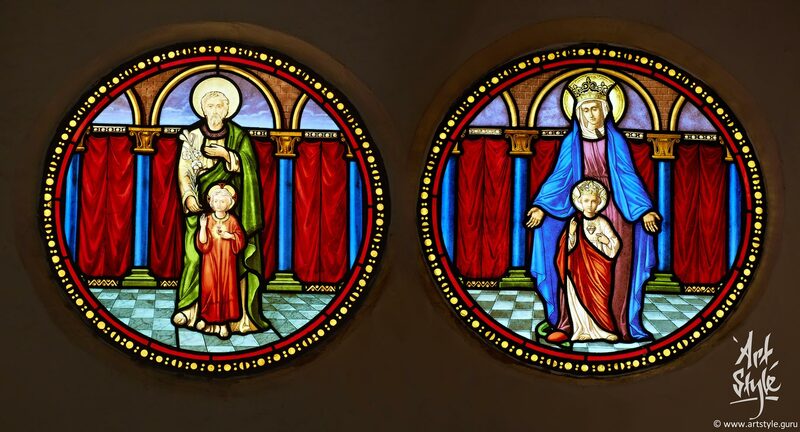 Stained glass at catholic Cathedral of the Sacred Heart, Vientiane, Laos. Two pictures together represent immanent unexplainable attribute of the God – his Trinity. 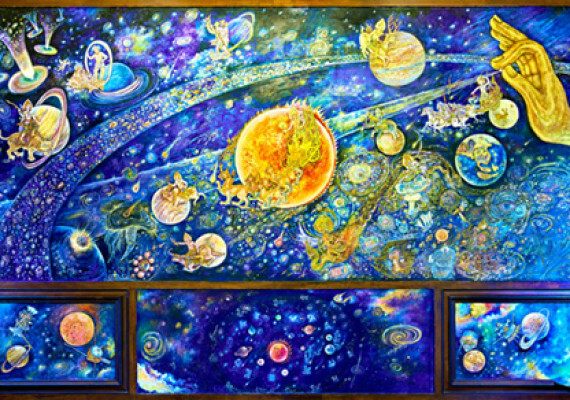 The Trinity can be seen everywhere, as all creations reflects the nature of its Creator. People can approach to understanding of the Trinity by it forms, which God open to the people: God-Father, Divine Mother and God-Son. Heart represents nature of the God, main creative energy of the Universe: God=Love. 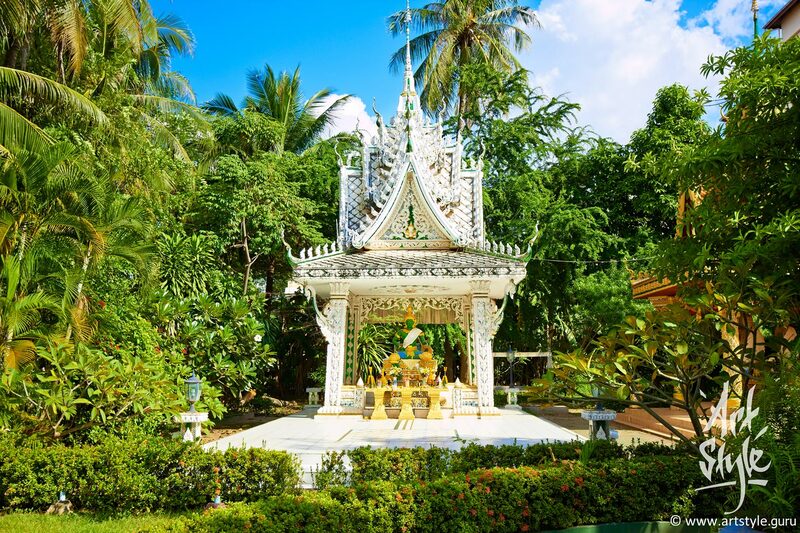 There is one noticeable difference in canonic depictions of the Trinity between European and Laotian traditions – God-Father at Laotian tradition wears green cloth. My explanation of this fact is that green is the attribute of Indra, one of the most influence and powerful spiritual creature at Laos area. So in spiritual perception of Laotians Indra was partially joined with a God-Father. Yong monks help elder to collect offering of parishioners during Pha That Luang Festival, Pha That Luang, Vientiane, Laos. Offering consists of three parts: – Money offering to support Sangha; – Decorations made from leaves to underline unity with the Nature; – Decorations and candles made from wax to underline interesting conception – “disidentification of your own personality”. “Disidentification of your own personality” also referred as enlightenment or satori (“full comprehension of a situation”). In short it can be described as follows: “The only one way for wax candle to reach immortality is to understand itself, that it is – not candle, but wax”. It means that person always refer his identity as his body (which is mortal). If person will understand, that his body is only form and his identity is something more than the form only – he will become immortal. The same during firing – only the form of the candle is destroyed, but its wax entity isn’t. 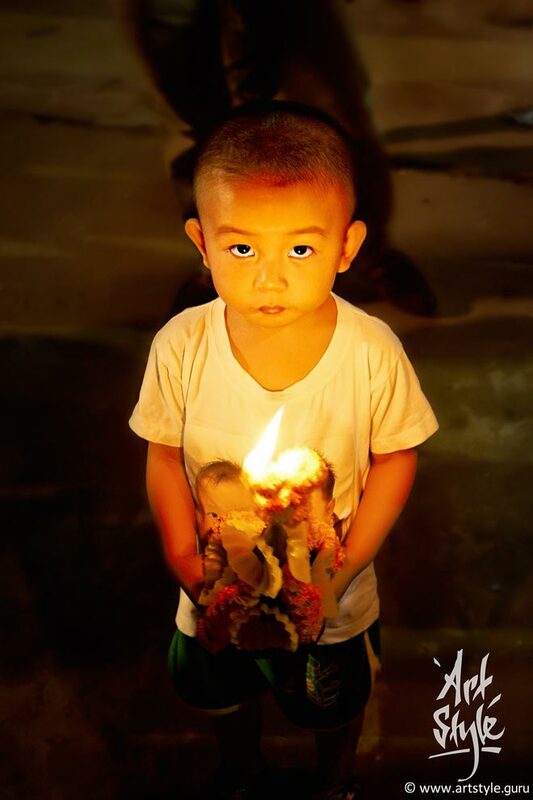 Baby holding his offering at That Luang festival, Wat Inpeng, Vientiane, Laos. Every baby is pure because his soul still remembers its experience from previous lives. Modern human loses his purity during growing up because he chooses the way of his mind, not his heart. To have trained mind of the elder and the inner state of a baby – is the real key of human happiness and harmony. At this blog post i will continue to show my impressions, Read more! I live in Thailand and do a lot of photos here. It is my way of Read more! I do photos not only in Thailand, but in all Asia region also. Read more! You must be logged in to post an opinion.